First up was 90s not-particularly-action-packed action movie, The Patriot. Steven Seagal plays a genius doctor who is called into action when a rebel militia, led by a bearded Neo-Nazi, release a lethal biological weapon in a small American town. Even though Seagal is clearly not a genius doctor – and his character development is slightly suspect and lacking in explanation (quiet doctor to martial arts master in a matter of minutes) – it is enjoyable watching him do his thing. The rest of the cast aren’t half bad either and, on the whole, the acting is sufficient. Personally, I also enjoyed the fact that I was never sure what the point of it all was. Is it hippy propaganda, or is it simply harking back to simpler times with no biological weapons and no fancy labs? To add to that, I’m not even sure how ‘American’ it is; in many ways it seems to speak negatively about the US (focusing on their views on biological weapons, war in general and the treatment of the Native Americans). 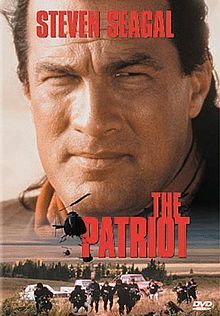 But whatever it’s about, The Patriot provides a mostly enjoyable 90 minutes, with some surprisingly heartfelt moments. And its ‘action movie’ claim isn’t completely defunct; featuring, among other things, a memorable death by wine glass.